Welcome to kindergarten/developmental kindergarten, and in many cases, to Fraser Public Schools! You and your child are about to begin the exciting new experience of starting school. It is during this first year of school that your child’s lifelong understanding of education and learning are formed. Our goal is to ensure your child has a successful first school experience that will help prepare him or her for a lifetime of learning. 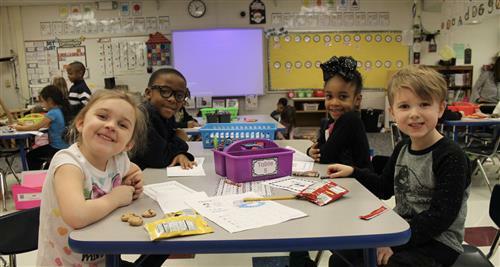 Students must be 5 years old on or before September 1, 2018 to enroll in DK or kindergarten. A waiver is available under the Registration Forms links for students with birthdays between September 1 and December 1. Our DK program is designed for students with birthdays between May 1 and December 1 who would benefit from an additional year of learning. Classes run Monday-Friday. Our DK program is housed at the Dooley Center. The children are given the opportunity to participate in a modified kindergarten curriculum taught by certified Fraser teachers. The children participate in specials classes including Art, Physical Education, Music, and 21st Century learning. These classes are limited to 17 children, so students benefit from more individualized instruction. The results are not reported on a report card, nor do they prohibit your child from entering kindergarten. The results provide a baseline of where your child is so that you and his or her teachers can individualize learning experiences for your child. The main goal of the readiness assessment is to increase your child’s success in school. The Brigance Early Childhood Screening takes about 20 minutes to complete. Please click on the school name to sign up for screening. All School of Choice students will test at Dooley Center. One of the important components of a child’s learning experience is the partnership that exists between the home and the school. We encourage you to become involved in your child’s school and active in their learning. Below are a few links with additional resources to help prepare your child for Kindergarten. Links on this page may take you to external websites not maintained by Fraser Public Schools.